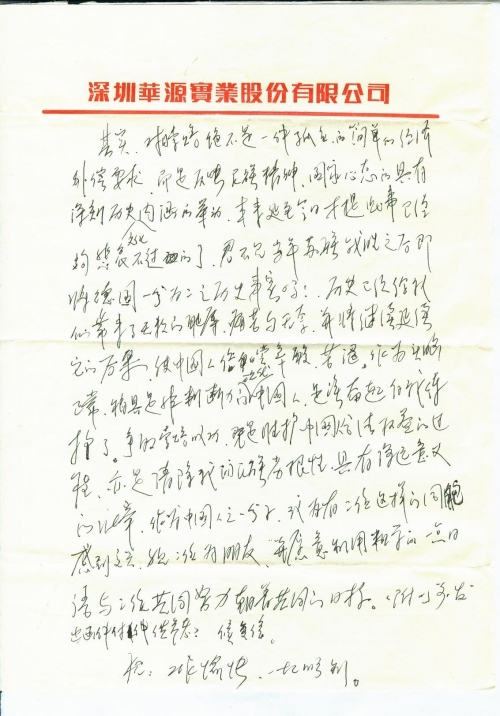 Other details:In 1938, Han Xiuhua’s uncle was shot to death by the Japanese Army; in 1944 the Japanese Army dispatched people to our village to collect tax, and developed dispute with my father Han Shenglin. 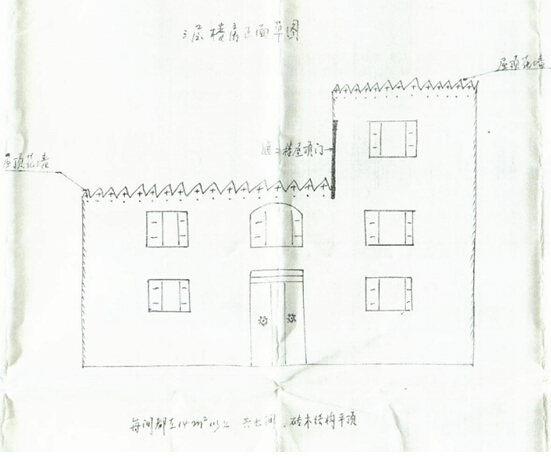 Afterwards the Japanese Army killed my father and grandfather Han Decheng with our houses destroyed and cattle looted. I’d like to express my sincere respect for you after knowing your great act from the magazine Daqian Digest. 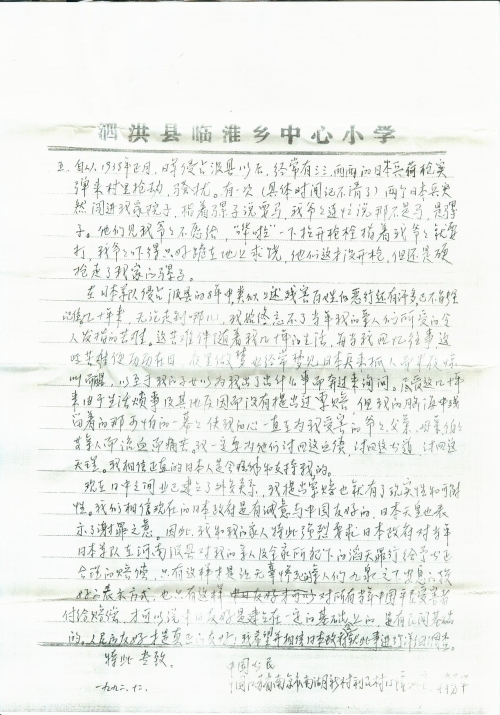 Frankly speaking, I printed and spread leaflets in Nanjing demanding compensation from Japan when the Japanese Emperor visited China last year, and I also wrote several letters to our government, the Japanese embassy in China and the Japanese government demanding compensation for the death of my father and grandfather killed by the Japanese army, but I haven’t received any reply. I’ve always believed that whether our government demands compensation from Japan or not shall not affect the civil claims for compensation. Of course, it will be the best if our government gladly works together with the common Chinese people by putting itself in their position. But for now, we cannot expect that. In fact, demanding compensation from Japan is never an isolated, simple request for economic compensation, but an act with profound historical and cultural meaning that reflects the spirits of the nation and the mindset of the country. It’s sad enough to bring up the topic at such a delayed time. Isn’t it a fact that the Soviet Union divided Germany into two countries after its victory? The history has brought the Chinese people countless shame, pain and frustration, the consequences of which will continue. It’s time that the modern Chinese people who have a normal mind and ordinary judgment made efforts to demand compensation. Success in getting compensation is not only a process of defending legitimate rights and interests of the Chinese people, but a great act to eliminate the deep-rooted bad traits of our nation, which is of profound significance. As a Chinese, I am glad to have you two as my compatriots and friends and I am willing to work with you towards a shared goal by using a little Japanese I’ve learned. (Attached is a letter I sent before for your reference). Looking forward to your reply. Wish you good luck with work and everything else. I am a Chinese citizen Han Xiuhua, 68 and live in Room 40#302, Building 15, Limincun, Nanhu New Village, Jianye District, Nanjing City, Jiangsu Province, China. I was born in Ji County, Henan Province, China and lived with my family in Dunfangdian Village, Ji County 47 years ago. 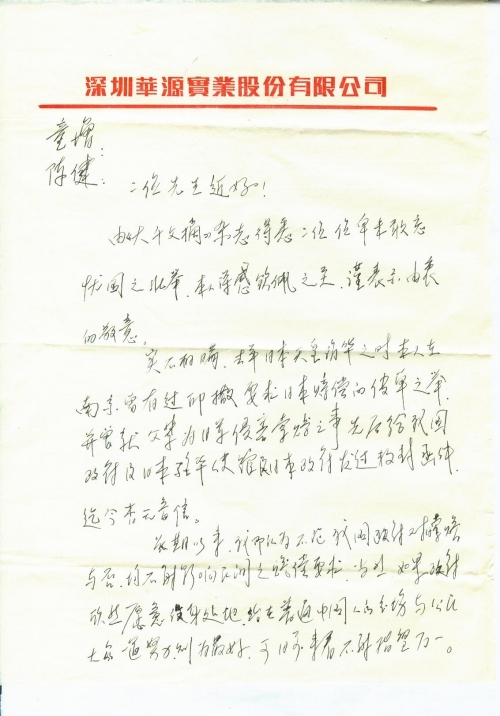 I am writing to strongly demand compensation from the Japanese government for the death of my father, grandfather and other relatives and the suffering of my whole family during Japan’s invasion of China to comfort the soul of my dead relatives who haven’t rested in peace and relieve the trauma and losses that survivors like me have suffered materially and mentally. I hope the Japanese government will carefully, seriously treat and handle my claim for compensation from a perspective of long-term Sino-Japanese friendship and promptly reply to me according to morality, international practice and international law. 1. 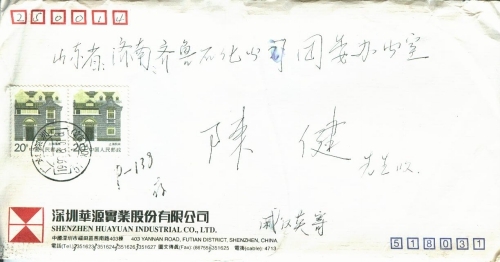 In lunar January 1938 when I was 14, the Japanese army invaded Ji County, Henan Province, so my whole family, like millions of other refugees, fled in gunshots from home to the mountain to the west of the railway for shelter. On lunar January 15, my oldest uncle Han Chunlin, who was a teacher, was shot dead by the Japanese army at the gate of his father-in-law’s in a village called Yangjing. He was then a little over 30 years old. 2. 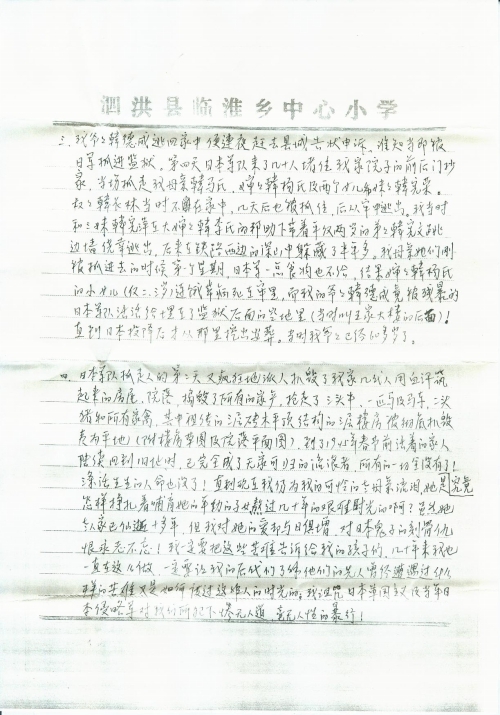 In early lunar June in the summer of 1944 (the year before the surrender of the Japanese army), the Japanese army sent neighborhood administrators (Chinese people Zhou Dianxi and Li Shigong) to our village to force donation. They had a conflict with my father Han Shenglin. On lunar June 16, my father Han Shenglin and grandfather Han Decheng went harrowing with cattle in a buckwheat field in the northeast of Dunfangdian Village. At dusk, my father was shot three times and killed in the field by the Japanese army led there by the neighborhood administrators. My grandfather survived by letting go of the cattle and hiding in a near-by sorghum field. 3. 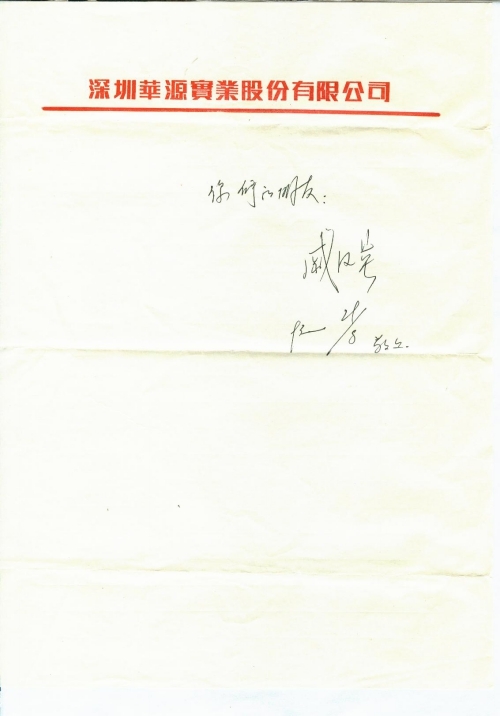 After escaping home, my grandfather Han Decheng went to the county on the very night to pursue justice. Unexpectedly, he was captured by the Japanese army and sent to the prison. On the 4th day, dozens of Japanese soldiers surrounded and ransacked our house and captured my mother Mrs. Han, née Ma, my younger sister Han Xianrong, my aunt Mrs. Han, née Yang and her two daughters. At that time, my uncle Han Changlin was out, but he was still captured days later. Luckily, He escaped from the prison later. Back then, with the help of my oldest aunt Mrs. Han, née Li, I, my third youngest sister Han Xianping and my only 2-year-old younger brother Han Xianwen escaped by jumping off a side wall. After that, we hid in a mountain to the west of the railway for more than half a year. 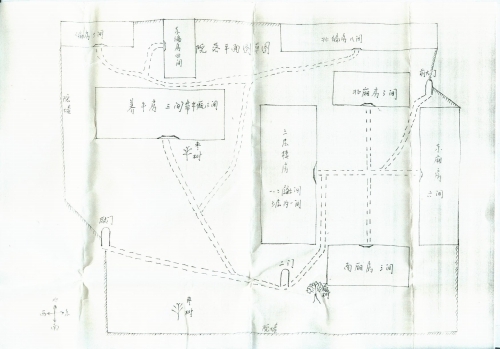 In the first week after my mother and other relatives were arrested and held in the prison, the Japanese army didn’t give any food to them, so my aunt Mrs. Han, née Yang’s younger daughter (only 2 or 3) died of illness and starvation in the prison. 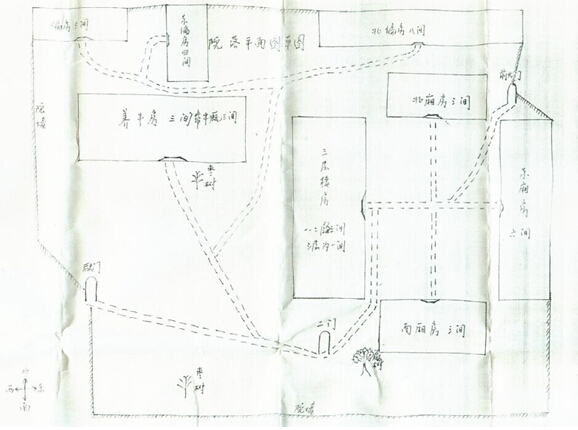 And my grandfather Han Decheng was buried alive by the cruel Japanese army in the deserted land (behind a building called Wang’s Building back then) behind the prison. It wasn’t until Japan’s surrender that we dug his body out and buried him. Back then, my grandfather was over 60. 4. On the second day after capturing my mother and other relatives, the Japanese army sent people to destroy our house and yard that were built by several generations of my family, damaged all property and robbed us of 3 heads of cattle, 1 horse and a cart, 2 pigs and all poultry. 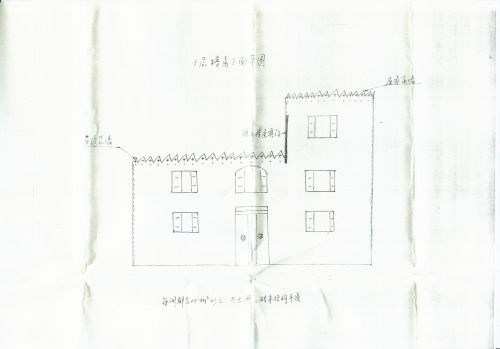 Moreover, our 3-floor brick and wooden building with a flat roof that was passed down for generations was razed to the ground (Attached is a draft of the building and a plan of the yard). When my family members gradually came back to our house before the Spring Festival of 1945, we found that everything was gone and that we became homeless vagrants. And three lives were gone! Even until today I still cry for my poor old mother. How on earth did she endure dozens of difficult years to bring up her young children! Although she passed away over 10 years ago, my love for her increases with time. And I will never forget my hate towards the Japanese army! I will tell my suffering to my children and actually, I have done that for dozens of years so that they will know what suffering their ancestors endured and how they spent the painful time. I charge Japanese imperialists and the invading Japanese army with cruel, inhuman atrocities they committed against us! 5. Since lunar January 1938 after the Japanese army occupied Ji County, armed Japanese soldiers would often come to our village in twos or threes to rob and harass the villagers. There was one time (I cannot remember the specific time) when two Japanese soldiers barged into our yard and said they wanted this horse by pointing at a mule. My grandfather immediately answered that was a mule, not a horse. Seeing that my grandfather didn’t want to give the animal to them, the two Japanese soldiers swiftly pointed their guns at him. My grandfather was terribly scared, knelt down and pleaded with them. They didn’t shoot my grandfather, but took away our mule. During the 8 years when the Japanese army occupied Ji County, they committed many similar atrocities that hurt the Chinese people and I cannot remember them all. For dozens of years, I can never forget the appalling suffering my relatives endured wherever I go. The suffering accompanied me for dozens of years. Every time I recall the past experiences, memories of suffering come flooding back. I often dreamed of the Japanese soldiers capturing people and would scream and wake up so that my children would worry about me, run over and ask me what happened. Although I didn’t claim for compensation in the past dozens of years due to chores and other reasons, the horrible scenes of the suffering of my grandfather, father, mother and uncle, etc. have remained with me and hurt me. I must pursue justice for them. I believe the upright Japanese people will understand and support me. China has established diplomatic relations with Japan, which makes my claim for compensation possible. We believe today’s Japanese government is sincere in maintaining a friendship with China. Besides, the Japanese Emperor has expressed apology. 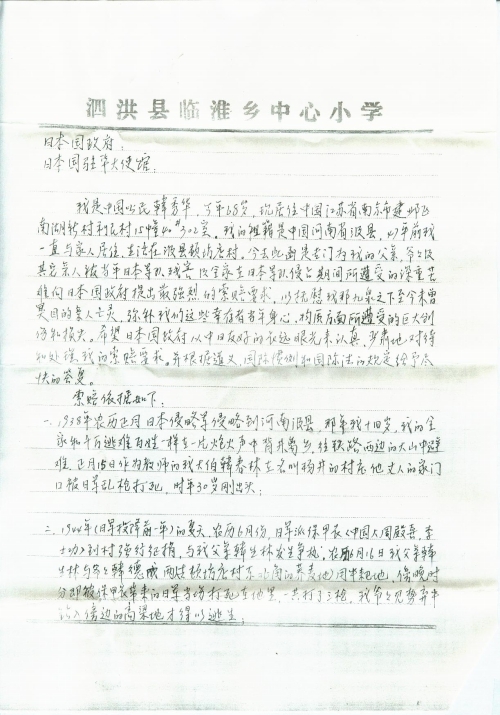 There, my family and I strongly demand a just, reasonable compensation from the Japanese government for the heinous crimes that the Japanese army committed against my relatives and my whole family in Ji County, Henan Province. Only by compensating all Chinese victims can their innocent dead relatives be rested in peace and can we say that Sino-Japanese friendship is built on a certain civil foundation. The friendship between the peoples is the true friendship. I hope and believe the Japanese government will carry out a detailed investigation of the above matters. 1：By check, pay to: “10,000 Cries for Justice”，mail the check to： 10,000 Cries for Justice，34400 Mission Blvd., Apt. 1201, Union City, CA 94587，U.S.A. 2：by Credit Card through PayPal，Please click the DONATE button below.